I composed this to reflect my love for jade and crystal. 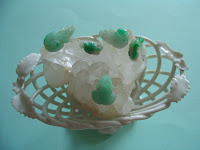 Shows tiny jade frogs frolicking on a slab of crystal. Hmmm maybe Crystal Jade Kitchen would like this for their logo !